Is it possible to display a directory listing of External Files on a Form and open them in their parent applications? Several queries of different kind received through E-mails pointing towards this objective, from Readers of the earlier Article: File Brower in MS-Access (Common Dialog Control). But, all of them fall into only one category, data files. All you have to do is to type the File Path like C:\Documents and Settings\UserName\My Documents\*.xls into a Text Box and click a Command Button and there it is; all excel files from the selected folder is presented on the Form as Hyperlinks on the Datasheet. I know you are not impressed, because you could memorize and keep entering the above Path or some other Path without difficulty. Then what about other numerous locations and sub-folders on several Disk Drives? Opening Windows Explorer is out of the question; to find the location and enter it into the Text Box Control manually. Well, if there is no other way then that also can be done. No, you will click on the Path Lookup Command Button to invoke something like the Common Dialog Control and browse to the location of the files you are interested in, select one of them and Click the OK Button. The Files' location address with the File you have selected will be placed in the Text Control. That saves a lot of trouble in finding the location of the files. It takes only few clicks of the mouse and we are doing it plenty of times a day. You may bring in the selected file into the list in Datasheet View by clicking the Get Files Command Button or modify the file name part with Wild Card characters (like *.xls, or Acc*.jpg) to bring in a group of files into the list. The Form has a simple design as you can see from the image given above. Following are the main elements of the design. A Table: DirectoryList with a single Field FileLinks with data type Hyperlink. 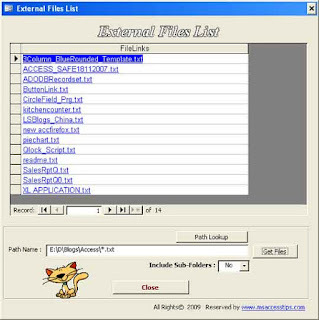 A Datasheet Form created on the above Table with the name FilesListing_Sub. 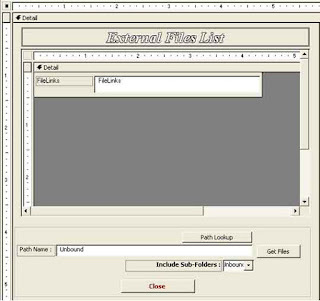 The Main Form FilesListing with the Datasheet Form inserted as Sub-Form that occupies the major part of the design. A Command Button (Name: cmdPathLookup) with the Caption Path Lookup runs the Sub-Routine and works like Common Dialog Control to browse and select a file from required location and insert the Path Name in the Text Box below. A Text Box with the name PathName to hold the location address (or Path Name of the Files) and to modify as per your requirement before you Click the Get Files Command Button. If you know the Path Name correctly then you may type it in the Text Box directly, whichever is easier to you. The Command Button with the name cmdGo and with the Caption Get Files, when clicked brings in all the files matching the Path Name specified and displays them in the Data Sheet View above. A Combo-Box with the name cboYN with Yes, No Values. If you set the value to Yes before clicking the Get Files Command Button; all files from the Sub-Folders of the selected folder, if any, also included in the output. The Command Button with the name cmdClose and with the Caption Close when clicked closes the FilesListing Main Form. 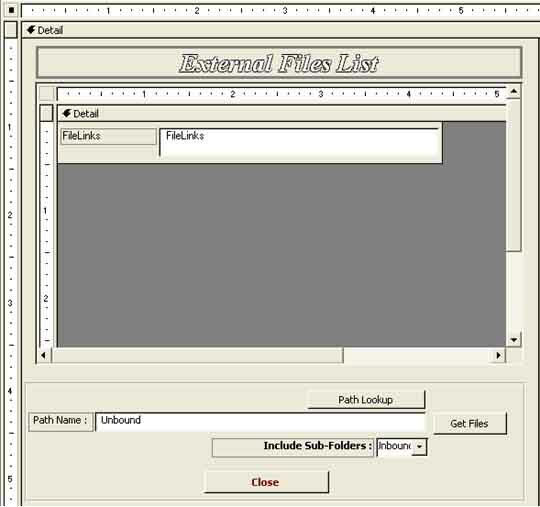 The Files' List is created as Hyperlinks in the target table: DirectoryList, every time, replacing the existing list of files, and appears in Datasheet View. You may click on the HyperLink to open that file in its parent Application to work with it. You can delete unwanted files from the list. Select a record by clicking on the left border of the list and press Delete Key or press Ctrl+- (press and hold Ctrl Key and press - Key). You cannot add a record manually or edit a record on the Datasheet (you may do so directly on the Table, if you like to mess around with it) so that the HyperLink Value Segments are not altered. If you would like to know more about the Hyperlink value Segments (four of them) and what they do; go to the link Open Forms with Hyperlinks in ListBox. You may download the sample database from the bottom of this Post and try it out before you design one of your own to understand it better. You can easily implement this in your various Projects by simply importing the Forms and the Table into them. 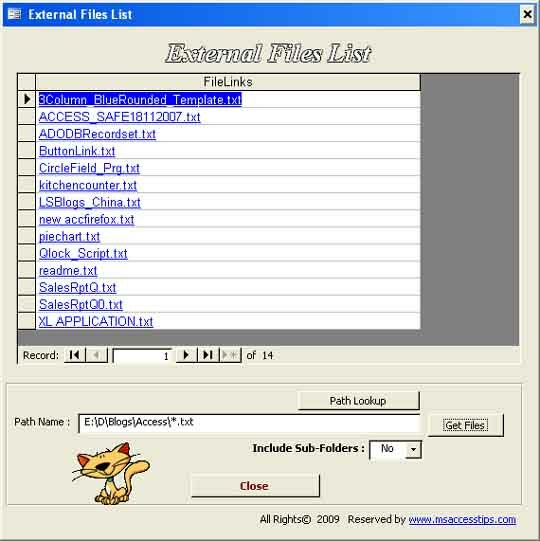 It is Access2000 Version file and Access97 users cannot use it. But, you can design the above Forms and Controls with their specific names as explained above by following Step-1 to 9. The Sub-Routines and Function which runs behind the Main Form FilesListing is given below. You may create the above design with the correct names explained under Steps-1 to 9, copy and paste the complete Code in the Main Form Class Module and save the Form. 'display it in the Pathname control. .Title = "Select a File from Target Folder"
Me!PathName = CurrentProject.path & "\*. *"
MsgBox "File Path Name required." strFolder = CurrentProject.path & "\*. *"
DoCmd.RunSQL "DELETE DirectoryList. * FROM DirectoryList;"
strFiles = strFiles & "#" & .FoundFiles(i) & "##Click"
MsgBox "No matching File Names found!" 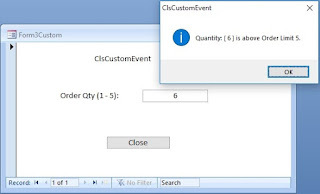 If there is any difficulty in running the On Click Event Procedure of the Path Lookup Command Button then replace that with the File Browser method explained in the Article: File Browser in MS-Access (Common Dialog Control). The bug is fixed now. You may download the Utility again. You may include the Sub-Folder (News) by modifying the above line as Y:\General\DHSWiki\News\*. * and change the combobox setting to YES to include sub-folders under News folder.